We have a few ginkgo trees in the village. A “living fossil,” originally part of a large and diversified group, its relatives fell by the wayside one by one but the ginkgo endured, persisted, and survived unchanged. It came into being some 270 million years ago, which, even by geological standards, is a very long time, well before a lot of things that we are familiar with today. In those days there were no flowers on earth, no grass, no palm trees in Florida, no whales. Ohio was a shallow sea. It would still be a while before dinosaurs ruled the world, and the first mammals appeared as timid creatures unaware of their future greatness. South America, Africa and Antarctica were joined at the hip. Human beings were just a distant To Do reminder in the evolutionary timetable. The ginkgoes descended from ferns and found a good way to be a tree on this planet, that long ago, and stuck to it. They did not take the easy route; they found their niche in disturbed environments along streams. With some 42,000 genes, two times more than us, the ginkgo can fend off more biological threats than other plants. Its leaves look like no other. Fan-shaped, with veins branching out into the blade, they are unique among plants that produce seeds; the veins may bifurcate, but never form a anastomosed vein network like seen in other plants. The leaves are the most recognizable feature of this tree. Now green, they will turn a glorious golden yellow in the fall. 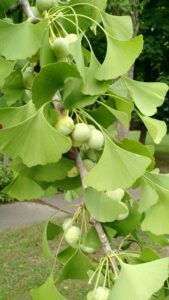 Ginkgo trees are either male or female. At this time of the year female trees bear fruit which can easily be seen on their branches. Their reproduction system is so primitive that the sperm has to propel itself towards the ovule using its thousands of flagella; no bees necessary or welcome. Two ginkgoes, a male and a female, can be found side by side on W North College St just a few yards east of the Xenia Ave intersection. The male tree is quite older and thicker, the female one is overflowing with seeds. Another ginkgo can be found to the east of that intersection. On the 300 block of Pleasant Street a mature tree and a baby one stand together. Ginkgoes also occur in other places in town. An amazing show of the ginkgo’s resilience took place in Hiroshima, Japan, where six trees located within a mile from the atomic bomb explosion survived, while most other living beings did not. They are still alive today.